if you could rub your palms across the planks of this old kitchen table, if we could all hear the scccrrch of the legs of the chairs scuffing across the floor boards of this old kitchen, if i could pour you all whatever it is you sip, there in the heavy chipped mugs that fit flush against your palms, well surely this morning we’d all be pausing, paying attention to the great light of the poet, the one with the gravelly cadence that made us wish she was our grandmama, or the wise lady who lived down the lane, or the prophet who knew our name. 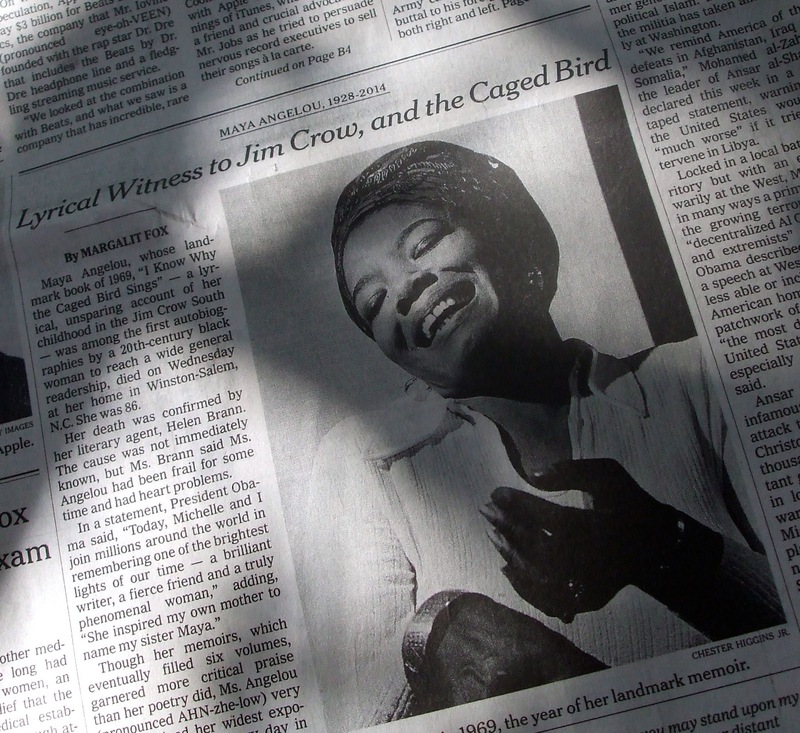 maya angelou died this week, on wednesday at 86, which you certainly know by now. so we are left to sift through her pages, her words, her rhythms, her heart as she’s sprinkled it across sentences, across years. a poet’s ashes, holy ashes, are the words she or he leaves behind, words pressed to the page. and we hold the poet to the light by sifting, poring over those everlasting traces of who the poet was, and how she saw the world, how the world filtered through her irreplaceable lens and settled on her soul. and what you do when someone passes into the heavens is you stop what you were doing, you draw in the deepest breath you possibly can, and, sometimes, you don’t want to let that breath go, afraid to let go of the air that once co-mingled with the air of the someone who’s gone. i remember that breath when my papa died, and for a flash of an instant i wondered if i could hold it forever, not wanting the breath of a world in which he’d dwelled to escape — ever — from the depths of my chest. but this is about maya, maya angelou, a poet and heart song who made me feel safe, safe in this bone-rattling, rockabye world. now i can’t say i’m any sort of scholar of maya. only that she’s among the ones — women, many of them — whose words i often read in triplicate, because the words are so breathtaking on the first whirl, my eyes and my heart simply go back to the start of the sentence to read it again. to breathe it again. to catch the updraft and make me go soaring. to delve into the construction, the word choice, to figure it out, to see how she does it. like watching, i suppose, a brilliant hand surgeon reweave the tendons of a woodworker’s thumb. or sitting off to the side of a painter as she daubs her brush in the palette of oily whites and yellows and blues and greens, and puts them just so on the canvas, and suddenly sunlight is dappled where before there was only a montage of paint dabs. so this dappled morning at the table, we sift through what maya has left us…. This letter has taken an extraordinary time getting itself together. I have all along known that I wanted to tell you directly of some lessons I have learned and under what conditions I have learned them. There have been people in my life who meant me well, taught me valuable lessons, and others who have meant me ill, and have given me ample notification that my world is not meant to be all peaches and cream. I have made many mistakes and no doubt will make more before I die. When I have seen pain, when I have found that my ineptness has caused displeasure, I have learned to accept my re- sponsibility and to forgive myself first, then to apologize to anyone injured by my misreckoning. Since I cannot un-live history, and repentance is all I can offer God, I have hopes that my sincere apologies were accepted. I gave birth to one child, a son, but I have thousands of daughters. You are Black and White, Jewish and Muslim, Asian, Spanish-speaking, Native American and Aleut. You are fat and thin and pretty and plain, gay and straight, educated and unlettered, and I am speaking to you all. should you choose to read a bit more about maya, the poetry foundation puts it poetically here. and, now for the best part of our pause, what lines from maya do you bring to the table? p.s. i hope she wouldn’t mind my calling her maya instead of the more stately ms. angelou. either one would do, and i beg her pardon — or yours — if the familiarity of using her first name suggests anything other than the deepest of dignified respect. Her work has always come to me as a gift. From an older cousin when I was 13 years old and lost in my new womanhood, all the way up to when I was 24 by a coworker who saw my spirit in her poem, “Life Doesn’t Frighten Me At All.” I keep the original Caged Bird book and the Basquiat illustrated poem on my coffee table or by my bedside. Her work has always felt like more than literary fodder, but reminders of the undeniable strength we possess inside each of us. Her words have always been like warm hugs on the toughest of days. This is all to say that, for me, her collective work has made more of an impact. How all of the stories, poems, and words speak to something that I have yet to understand or feel able to articulate. Reading her work has felt more like a spiritual process than an academic one. amen. “handle them both with prayer.” oh, that we should always have prayer on our hearts. most especially in those moments when what we say and do so deeply matters. It’s a Sunday morning and I’m reading this at my breakfast counter and just went to get the Modern Library Collected Autobiographies of Maya Angelou that just came in the mail. I wanted to reread all her work. I was so struck yesterday by her emotional and vulnerable honesty as she describes the beginning of the sexual abuse by her mother’s boyfriend. After the first incident, she writes ” … and then came the nice part. He held me so softly that I wished he wouldn’t ever let me go. I felt at home.” Maya Angelou did so much to bring child sexual abuse out of the dark and to help people understand the confusing range of feelings children have about it. She dared to say the unsayable. oh, sweetheart, thank you for bringing that chilling line to the table. and for the title of the collected autobiographies. i love that to honor her, you are reading her. beautiful.